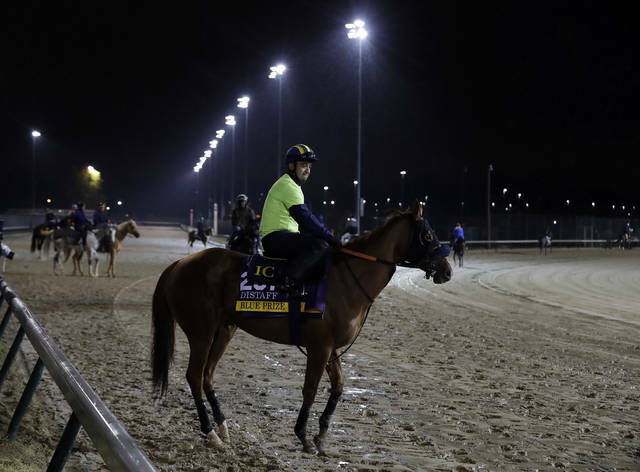 LOUISVILLE, Ky. (AP) — The Breeders’ Cup is back in familiar surroundings at Churchill Downs, with an additional stakes race bumping the two-day program to 14 and prize money up to a record $30 million. As always, the marquee race is Saturday’s $6 million Cup Classic that could help determine which thoroughbred ends up as Horse of the Year. Not to mention, establishing the top horse in several age divisions along with the top jockey and trainer. One notable absence from the Classic is Triple Crown winner Justify, whom trainer Bob Baffert retired in July because of an ankle ailment. That leaves the Classic without horse racing’s biggest name, but also a bunch of horses poised to make their presence known — and bettors happy. Accelerate aims to make it six wins in seven starts this year as the 5-2 favorite in the 1 1/4-mile headliner. 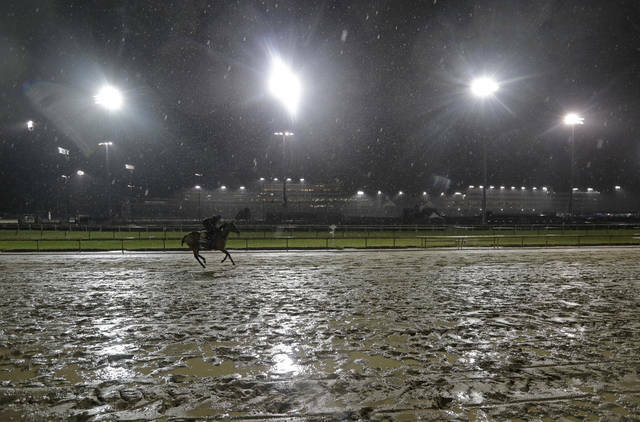 The season-ending championships should also provide a glimpse of what to expect when racing returns to the historic track for next May’s 145th Kentucky Derby. Friday’s first day set aside for 2-year-olds could help establish the contenders. Things will begin with the inaugural Juvenile Turf Sprint, a $1 million event to be run over 5 1/2 furlongs. The feature is the $2 million Juvenile, where 5-2 favorite Complexity will race 1/16 mile in search of a 3-0 start. 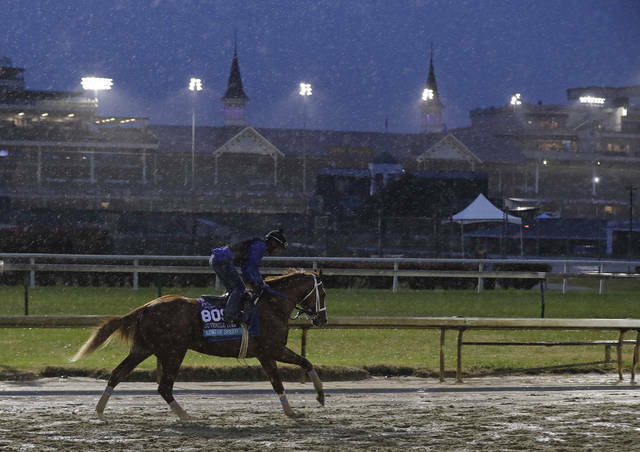 Churchill Downs is hosting the season-ending world championships for a record-tying ninth time and first since 2011. Santa Anita has also hosted nine times, most recently in 2016. Bob Baffert’s decision to not run Justify in the Classic is offset by two horses coming off six-month breaks. West Coast’s runner-up finish to Accelerate in the Awesome Again Stakes was among three seconds this year. McKinzie’s Pennsylvania Derby victory came after he was disqualified to second in the Grade 2 San Felipe in March. The 3-year-old also won the Grade 3 Sham at Santa Anita. This race for fillies and mares features the two most recent Kentucky Oaks winners in Monomoy Girl and Abel Tasman. Trained by Louisville native Brad Cox, Monomoy Girl has won five of six as a 3-year-old and might have been unbeaten if not for a disqualification to second after winning the Grade 1 Cotillion in September. Second in last year’s Distaff at Del Mar, Abel Tasman has eight wins and four seconds in 15 career starts and was last year’s Eclipse Award winner as top 3-year-old filly. British filly Enable will make her American debut in the $4 million Breeders’ Cup Turf as the even-money favorite behind Lanfranco Dettori. The 4-year-old has won both starts this year, including her second consecutive win in the Arc de Triomphe in France by a neck. She has nine wins and a third in 10 starts and more than $8.5 million in career earnings. Irish-based trainer Aiden O’Brien has 15 entrants among eight races this weekend, including 2017 Juvenile Turf winner Mendelssohn, who’s entered in the Classic. The Breeders’ Cup Mile will have four O’Brien horses, while Friday’s Juvenile Turf Sprint has three. The Juvenile Turf has 4-1 favorite Anthony Van Dyck, who will break from the No. 14 post. The $1 million Cup Dirt Mile and $2 million Cup Distaff have moved from Friday to Saturday and expanded the card to nine races. The Distaff is now part of the final four races building up toward the Classic.